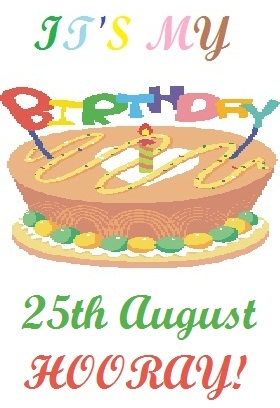 Of my online friends, there are a few who have birthdays in August. Growing up, I was, most of the time, the only one in my class whose birthday fell in August. I was never sure whether I liked being born in August. I was pleased that I could celebrate in the summer, and that I didn’t have to attend school on that special day. But it also meant that my birthday wasn’t celebrated at school and I hardly ever had a party because other children were on holiday and, usually, so were we. I once had a birthday party at a summer school. Children came and enjoyed the cake, but they soon ran off to watch the afternoon film when I wanted them to stay and play games. Being born at the end of August meant that I was always the youngest in my class. I know that fact wouldn’t necessarily affect anyone adversely, but in my case being young and immature didn’t help my status in class society. Now, I’m too old and not old enough to have a fuss made of my birthday, but I thought I’d tell you anyway. Happy Birthday Miriam! I hope you do something wonderful today. My daughters were born in August too, we had a lot of party issues like the ones you describe. Happily now they prefer to celebrate with a small group so life is easier. Happy Birthday Miriam! I have my birthday in the middle of the Australian summer school holidays too. I did not have birthday parties and I was always the youngest person in the class too! Thank you, everyone. My day was… hmm. I’ll have to write another blog post! Thank you! No, some numbers just don’t make sense and are better not mentioned!